Review from the Newsletter of the World Association of Soil and Water Conservation Volume 18, Number 4 October – December 2002. Page 13. I first met Peter Storey some two years ago at a meeting of the Association for Better Land Husbandry. Two things immediately impressed me: his very practical approach to the problems of land conservation and his great enthusiasm. Peter is an innovator and during the course of the meeting he demonstrated one of his inventions, "The Good News Level". (See WASWC Newsletter 16(3) August 2000 for a description of the level.) Peter also discussed the books that he was working on. These were to be based on his years of experience of working with small, resource-poor farmers in the humid tropical steeplands of Nepal and Taiwan. His intention was to produce a practical guide to field workers and a more theoretical version for administrators and senior officials. Work has progressed and the good news is that the first of these books has recently been published and is now available. This is Volume 1 and is the more theoretical of the books. The subsequent volumes (Volume 2 – Soil Improvement and Volume 3 – Soil and Water Conservation) that deal with practical application are expected to be available shortly. 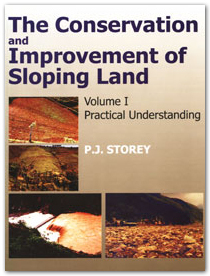 The Conservation and Improvement of Sloping Land, Volume 1 – Practical Understanding is, as the name implies, a practical handbook on the basics of how to improve and conserve sloping land. It is a comprehensive manual of 323 pages that will provide an invaluable guide for a wide range of people working in rural development and related subjects. Not only does he provide the reader with the sort of basic information that every field worker should have about soils, including their formation, chemistry, physical attributes and management, but he also provides pages of useful information on related subjects, including the selection and introduction of suitable vegetation, livestock management, surveying and approaches to extension. All this is done in very easy to read English with the use of technical terms being kept to a minimum. The book is well illustrated with simple diagrams and easy to understand tables. of other workers in Africa and other parts of the world. Peter Storey is very much a practical man and, while some of the approaches and suggestions in the book may be unconventional, they are all based on experience and what has been proved to work under the given conditions. This book will provide an invaluable guide to any rural development worker faced with the basic problem of farmers in the developing world – how to gain the maximum productivity from their land while at the same time conserving its soil and fertility. In this issue of our Newsletter, I would like to bring to the attention of Members two very different publications. Both however are of great interest and significance to our many disciplines. First, a work by Member Peter Storey. The Conservation and Improvement of Sloping Land, Vol. l. P.J. Storey. Science Publications Inc. ISBN 1-57808-201-3. PJS has a wealth of experience in this field, particularly in Taiwan and Nepal. Here in this Volume 1, subtitled ‘Practical Understanding’, he brings this experience to bear by concentrating, but not confining, his attention to the basic principles that lie behind this broad field of endeavour. Two further volumes are promised, devoted to practical applications. He has produced a comprehensive manual covering virtually every aspect of the subject, bringing clear detail to the uninitiated and a timely reminder to those of us who have also been involved in this area. Essentially, he is asserting that it is not too late to reverse, or at least substantially mitigate, the effects of population pressure on these marginal lands. Also, how to go about doing it! Members seeking further detail and copies of the work should contact the author.